I always found Batman's tags and labels helpful and inspiring to a kid who wanted to build his own Batcave. At one point I worked with some friends to renovate an abandoned horse shed into a secret hideout. 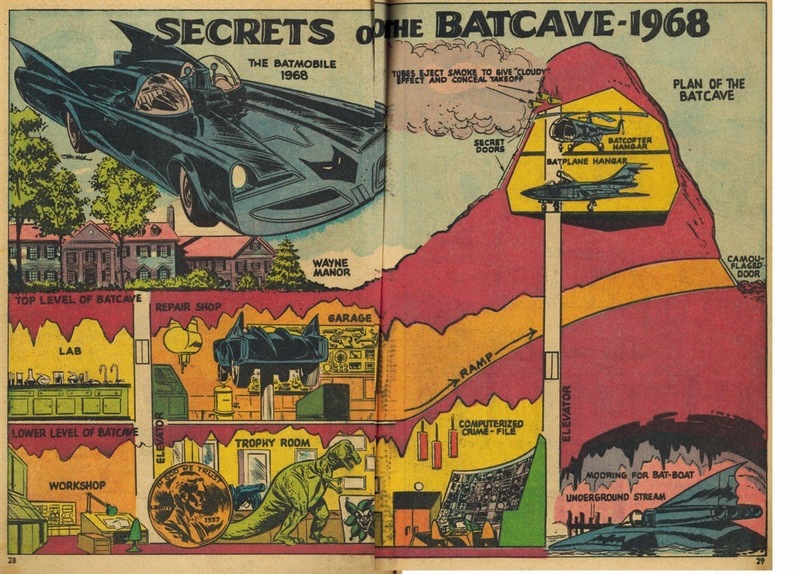 Although fun, it was never as impressive as Batman's Batcave from 1968. Under Wayne Manor, Batman has it all: a lab, computerized crime files, trophy room and Batplane hangar. 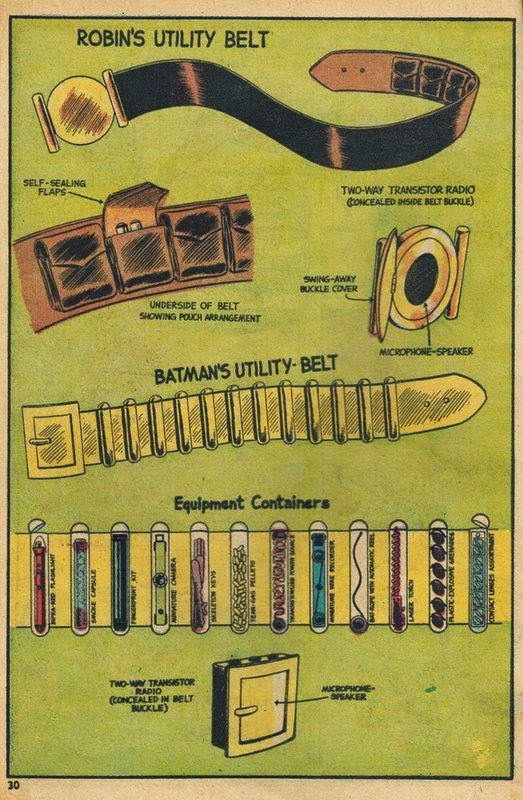 While the Batcave was awesome, the Dynamic Duo's utility belts totally confused me. They always seemed to have the right gimmick stowed away, but these detailed drawings are pretty limited. Time hasn't been kind to the utility belts. "Self-sealing flaps" are about as fancy as Velcro, and nearly everyone has a two-way communicator (cell phone, duh!). 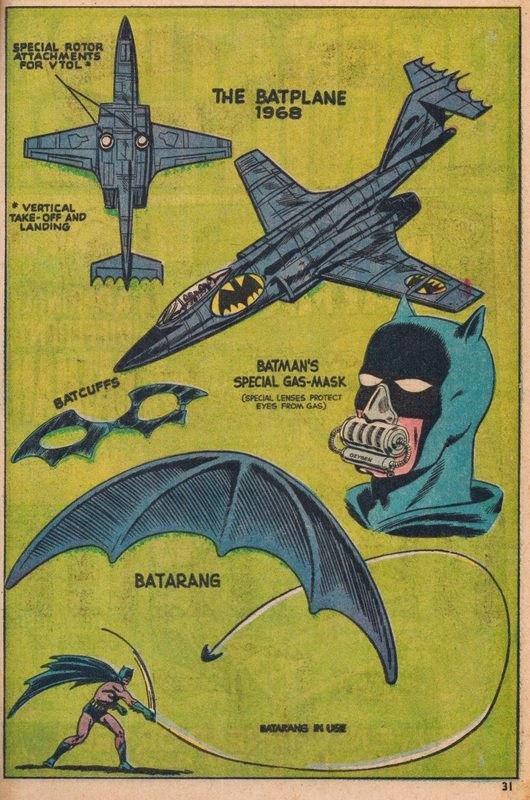 This last panel is from a story where Batman and Robin design a new Batplane. I don't think I'd like to have to use the "human ejector tubes." 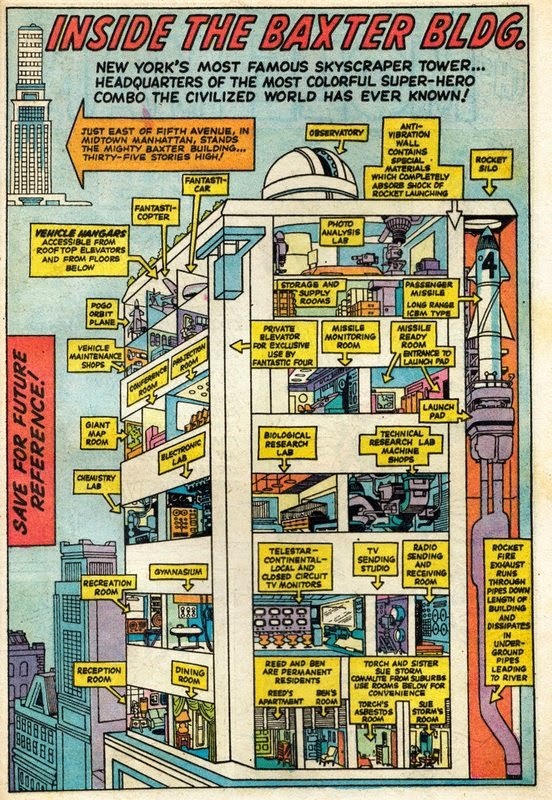 I always loved the maps and cutaway views of the Justice League's headquarters, Challenger Island, or the Bat Cave. Switching from DC to Marvel, here's "Inside the Baxter Bldg." from the Fantastic Four Annual #1. Pencils by Kirby. Note that "Torch and sister Sue Storm commute from suburbs -- use rooms below for convenience." Both Ben's room and Johnny's room stand between Sue and Reed. Sue's room is dangerously close to the exhaust pipes from the rocket silo. World War I was the unfortunate result of mixing modern technology with traditional warfare. 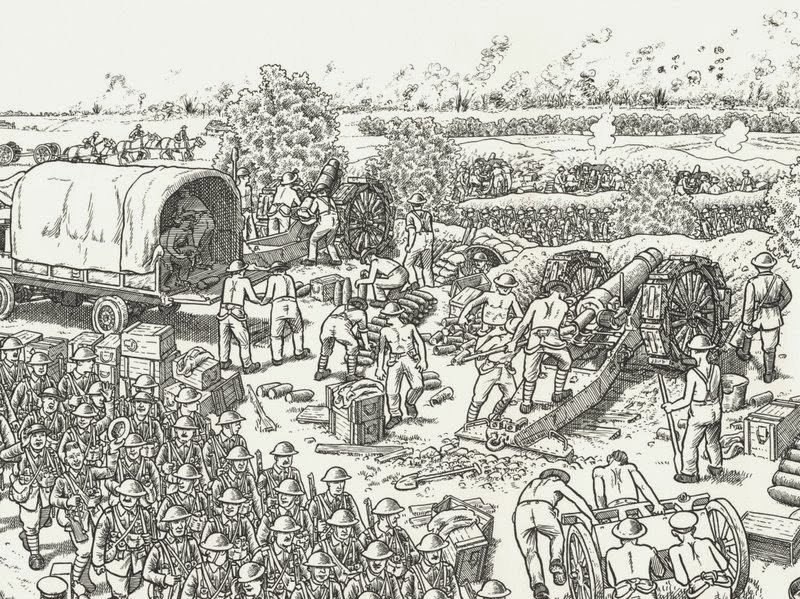 Applying the assembly line mentality to the battlefield meant that thousands of new recruits and untried weapons could be quickly fed into the trenches, often with disastrous results. Uniforms, and protective headgear were not made for modern warfare -- they were usually more of a liability than an asset. And although planes, tanks and guns were changing almost daily, those so-called advances only made the weapons more unpredictable. Meanwhile, medical treatment was the same as the previous century. Antibiotics and sterile environments were simply not available, and even a simple wound was often fatal. This year marks 100 years since the beginning of World War I. Obviously, one hundred years means that hardly anyone alive today was there, and of those few, probably none of them remember it. So, it is up to the historians and researchers to keep the memories and experiences alive. Since 1991, and CNN's reporting on the first Gulf War, Americans have been used to immediate, and often sanitized, images of warfare. Going backward in time, TV and newsreel footage of Vietnam, the Korean War, and World War II are also commonly available. But photos and movies from World War I are much less common. 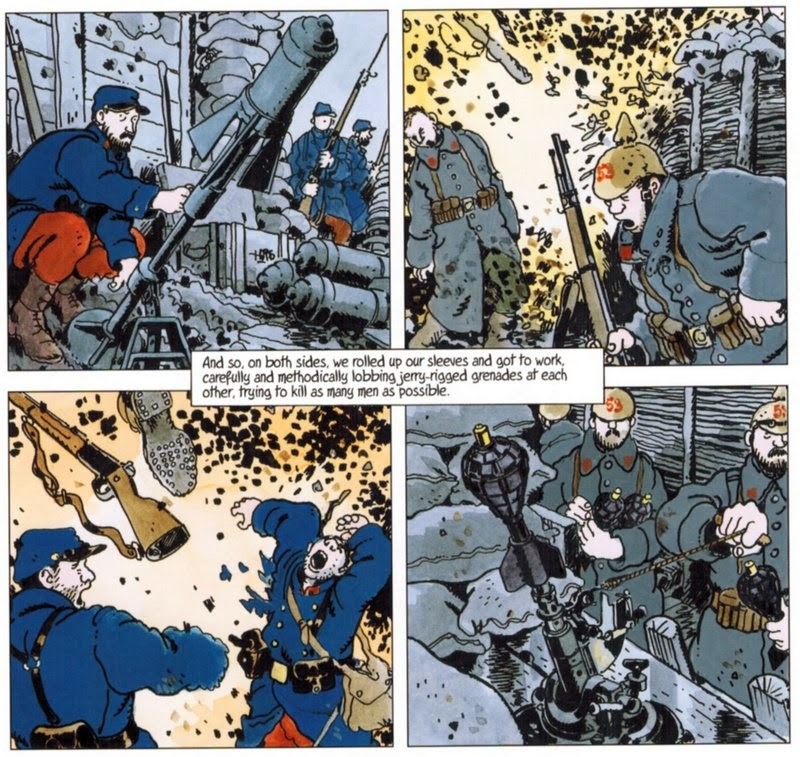 So, it is interesting to see two recent graphic novels covering World War I. The Great War: July 1, 1916 by Joe Sacco is an epic accordion book focusing on one day during World War I: July 1, 1916, the Battle of the Somme. The battle was supposed to be the turning point in the war, the Big Push, that would break the German line and morale. The Great War is a 24-page long epic scroll of the battle. It starts with a scene of British General Douglas Haig strolling the grounds of the Scottish Churches' Hut on the ramparts of Montreuil-sur-Mer in France. As the scene shifts we see the rear lines, new recruits, polished cavalry soldiers, and neatly packaged Howitzers alongside stacks of rations and supplies. The scroll continues into the night before the battle, showing soldiers packed into trenches so tightly that most slept standing up, if at all. And then, with a bang, the battle begins at 7 am as scheduled by the regimented British commanders. Sacco says that one of his influences was the Bayeux Tapestry. The reference is immediately obvious, although, the Normans were more successful in their attack than the British were at the Somme. Of the 120,000 British troops in the battle, nearly half of them were dead by the end of the day. The basic assumptions for the attack were horribly inaccurate, but once the machine of war was put into motion it was almost impossible to stop. To call off any part of the attack would have branded the generals and captains as cowards. Additionally, military policemen were placed among the troops to stop any stragglers from retreating and turn them toward the front. A detail of one page of the panorama of the Western Front in Joe Sacco's The Great War. Accompanying the scroll is a separate book "On The Great War," with notes by Joe Sacco, and an essay by Adam Hochschild providing some historical context for the battle. In Sacco's notes he mentions Goddamn This War! by Jacques Tardi & Jean-Pierre Verney. Originally published in French in 1993, Fantagraphics has recently printed it in English. Jacques Tardi has been a renowned comics artist in France since the 70s, but a lack of translation into English has limited distribution of his work in the US. In the past couple years Fantagraphics, especially the late Kim Thompson, has been translating his books. Goddamn This War! is a punch-in-the-gut recounting of a French soldier's experience during World War One. The story is told from a first-person point of view, but it seems like we could be jumping from any soldier to another. The narrative is disjointed, and most characters only appear briefly before they die in a trench, or are blown up, or are shot before a firing squad. The only recurring character is a German soldier who appears from time to time as the opposing army's version of our unreliable narrator. Simply put, war is hell. Soldiers are shot, blown up, caught in barb wire, buried as trenches cave in, and die in myriad miserable ways. Even when there's hope there's death. Men brought back from the front have simple wounds and are expected to recover, but then die from gangrene. One reason, is that the wounded are transported in 8-horse, 40 man rail-cars that are still soiled by horse manure, adding to the infection. Goddamn This War! has a lot more narrative than The Great War. One interesting commentary includes the story of Maggi Kub stores. These were Swiss stores that sold soup bouillon and other groceries, but because of the name the French thought they were German stores, and fronts for spies. In a fit of paranoia, their billboards were thought to be directions for the invading Germans, so a French minister ordered destruction of any sign near railways. The story is tough, and the artwork holds up its end of the work. While it starts full of color, after the first year of war the drawings are mostly shades of grey punctuated with red. After the war ends, some colors return, but not many. 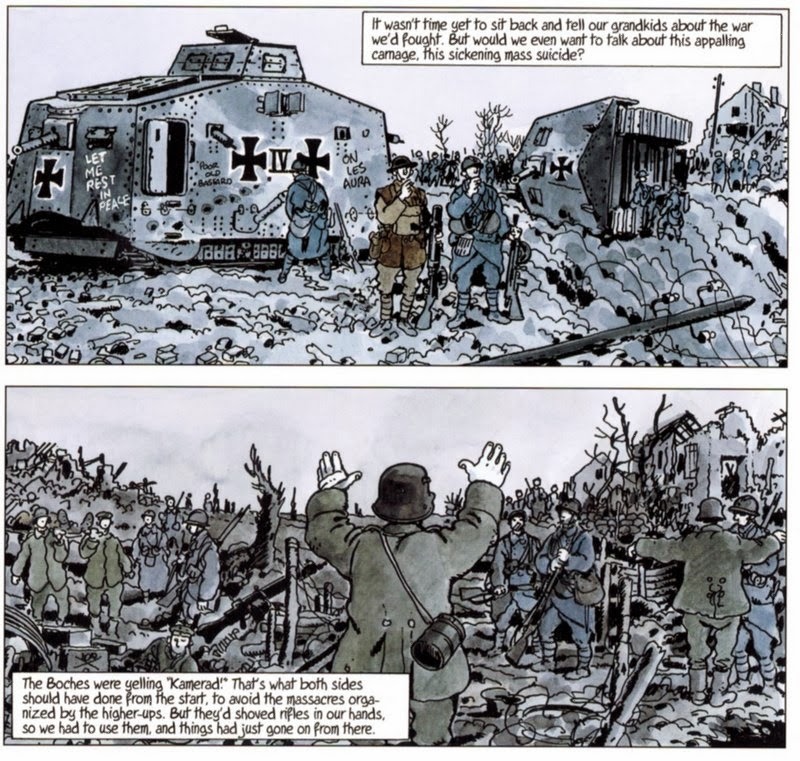 As living memory of World War I fades, both Sacco in The Great War, and Tardi and Verney in Goddamn This War! provide a "you are there" perspective on events of the war. They do this with cartoons, but the artwork provides enough immediacy that you feel for the drawings on the page. This is important. As Sacco mentions, it is not for him to indict anyone, it is enough to present the images to make one realize the futility of war. This review should open with a warning: reading Relish will make you hungry. Relish: My Life in the Kitchen is a foodie graphic memoir with recipes. It's less like Anthony Bourdain's "Kitchen Confidential " and more like Ruth Reichl's "Tender at the Bone ," exploring the influences her family and friends had on her food experiences as she grew up. There are twelve chapters, ranging from her memories growing up with foodie parents living in New York to trips to Mexico, Japan and Italy, and her later experiences as she lives on her own. Much of the book looks at her family. We learn that when her mother was pregnant with Lucy, she worked as a cheese monger at Dean & DeLuca, and also found catering gigs. Her father puts a strong emphasis on culture in books, music and art, as well as enjoying fine meals. Together, they provide both the environment and genetics that spur Knisley to create Relish. Although this memoir is personal, it is easy to find common themes that everyone can relate to. Her trip to Japan sounds a lot like my own experience when I chaperoned a group of school kids to that country. I also recognize the feeling of having a craving, and then baking a batch of cookies simply to eat one. Similarly, her story of eating a croissant (or four) early one morning in Venice, Italy sounds familiar. All this underscores her point: food brings us together, and many of us live to eat. The cartoon style does a great job at visual short-cuts. I particularly liked one frame showing her looking into a window at the cute cheesemaker guys -- no need to describe further. Also, she puts the cartoon medium to good use. Rather than find actual portraits of Mr. Fox and Mr. Obel, the founders of the store where she worked, she draws them as she imagines them. 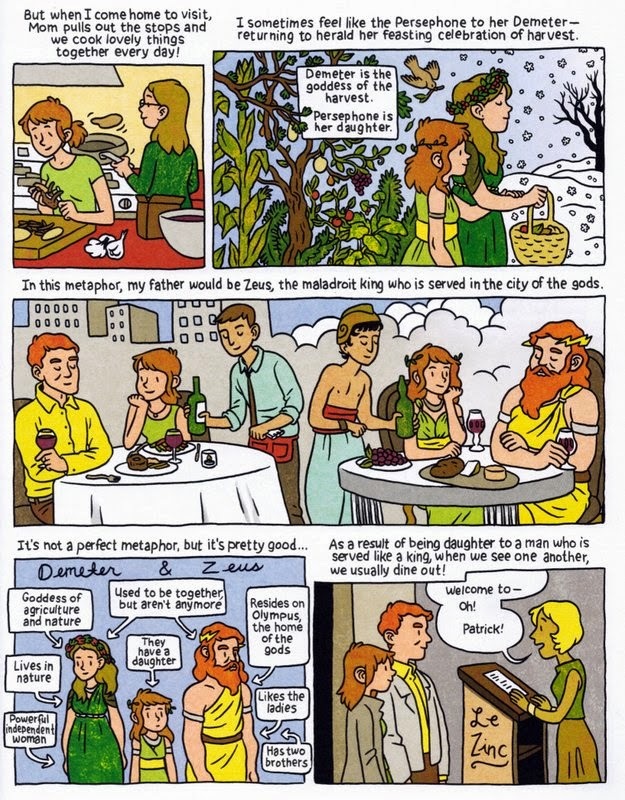 I also liked the cartoon comparisons of her mother as Demeter, and her father as Zeus. The drawings of the food, while cartoony, still make me hungry. Even better, the recipes sound delicious. I'll have to try her sushi drink -- ginger, lime and maple syrup over seltzer water ("add vodka to taste"). Relish works on many levels: as a memoir, as a YA reader, as a recipe book. Best of all, the levels mix together, like the layered enchilada her mother made. Excuse me now while I go shopping for ingredients to make the sauteed mushrooms with garlic and olive oil. 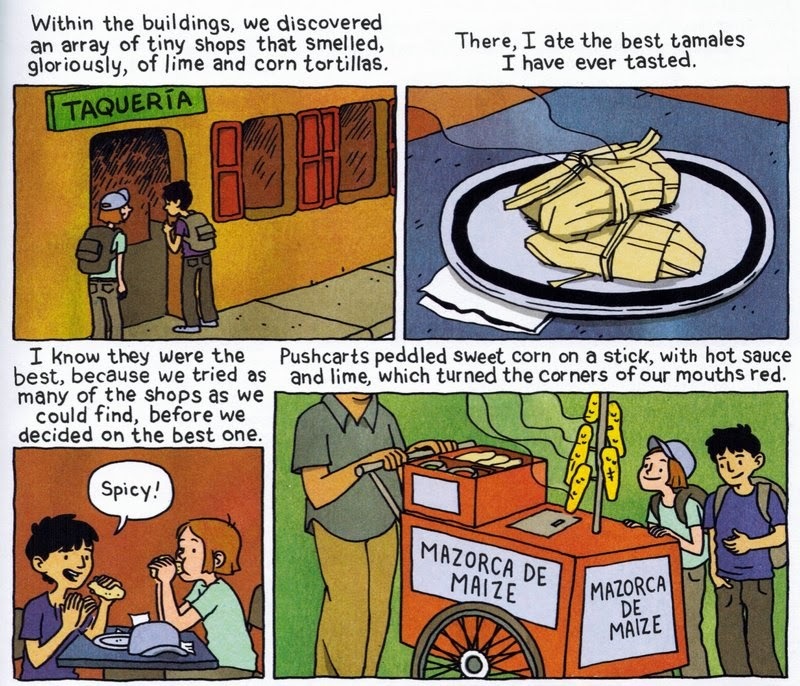 These tamales, even though they're comics, look so good. Lucy Knisley is also the author of French Milk and Make Yourself Happy. Her website is www.lucyknisley.com.